...... 3GS, iPhone 4, iPad, etc. 1. Backup all media content, including music, playlists, movies, photos, TV shows, ebooks, podcasts, etc. from you iPod/iPhone/iPad to your Mac. 2. Retrieve iTunes library or files when changing a Mac. 3. Put your favorite videos and music from your old device to your new device. 4. Allow several devices connected with a Mac and switching between the devices to transfer freely. 5. Copy DVD movie for playback on your portable devices. 6. Transfer any formats of video/audio such as AVI, FLV, MPG, MP3, etc. to be enjoyed on your iPod video, iPod Touch, iPod classic, iPod nano, iPad, etc. 7. Put your iTunes content into your iPod and iPad for playback. 8. Support batch transfer, to copy the entire playlist at one time. 9. Check your music, movies, photos, and playlists in pleasant and clear thumbnail view mode. 10. Browse files in clear catalogs like artists, albums, genres, etc. Free download and convert online video to iPhone, iPod, PSP... for Mac users. Includes Mac DVD Ripper, Mac Video Converter, Mac DVD Copy and Mac DVD Creator. Qweas is providing links to Wondershare TransPod for Mac 2.0.0 as a courtesy, and makes no representations regarding Wondershare TransPod for Mac or any other applications or any information related thereto. Any questions, complaints or claims regarding this application Wondershare TransPod for Mac 2.0.0 must be directed to the appropriate software vendor. 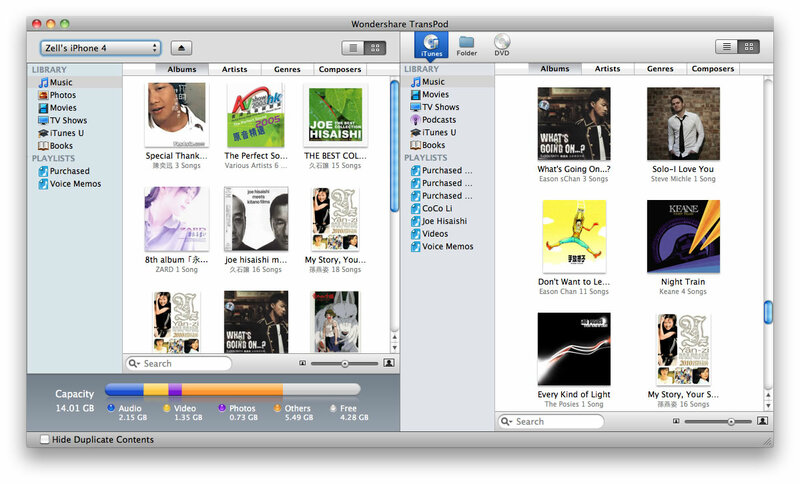 You may click the publisher link of Wondershare TransPod for Mac on the top of this page to get more details about the vendor.